How to start or stop services on the Windows 8 Services console? 1. Login as an administrator and start the Services console as described in the previous tutorial. 2. Scroll service list up and down to locate the service that you are interested in, for example "Print Spooler". 3. 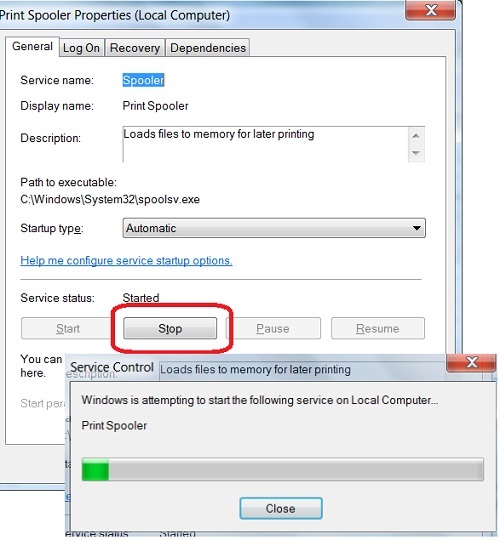 Double-click on "Print Spooler". You will see the "Print Spooler Properties" screen showing up with the "General" tab. 4. If the service status is "Running", you can click the "Stop" button on the General tab to stop it. 5. If the service status is "Stopped", you can click the "Start" button on the General tab to start it. 7. When it's done, the service status will be changed.